﻿ Inntel Hotels Art Eindhoven Eindhoven. JIMAT di Agoda.com! Inntel Hotel Art Eindhoven terletak di pusat bandar, dalam jarak 5 minit berjalan kaki dari Stesen Kereta Api Eindhoven. Hotel ini menawarkan bilik dan suite yang luas. Sebahagian daripada hotel terletak di dalam rumah api Philips yang tersergam megah, yang dibina pada tahun 1909. Bilik-bilik direka bentuk secara individu. Pelbagai warna dan corak yang digabungkan dengan perabot yang dipilih secara eksklusif mewujudkan pengalaman yang berbeza di dalam setiap bilik. Bilik-bilik loteng terletak di rumah api dan menawarkan pengalaman bandar yang asli menerusi siling setinggi 4 meter. Tetamu boleh menikmati bufet sarapan champagne yang dimasak secara langsung, makan tengah hari atau makan malam intim untuk 2 orang di restoran. Bar hotel terkenal dengan pilihan wiski dan bir yang pelbagai. WiFi percuma disediakan untuk tetamu di seluruh hotel, begitu juga dengan garaj letak kenderaan (bayaran dikenakan). Stadium Philips terletak sejauh 7 minit berjalan kaki. Kampus High Tech berada sejauh 5 km dan Lapangan Terbang Eindhoven berjarak 7.5 km. Efteling terletak dalam jarak 30 minit pemanduan sementara Den Bosch berada 20 minit perjalanan menaiki kereta. Smaller pets which are less than 15 kilograms are allowed in the hotel, at a maximum of 2 per room. Additional charges will apply. We needed to be in the center of Eindhoven, so then this is an excellent hotel. It is ok but you can get better value for money. Beautiful modern hotel, very spacious with a nice park and café outside. Drawbacks...only one outlet at floor level for charging phones and no reading lamps near the bed. Stayed for 2 nights in early Jan 17. Hotel room was pretty spacious. Breakfast could be better with a wider variety but it was already good. Location is pretty good with the train station a stone's throw away. It is also near the city center as well. Pretty much a good hotel. Recommended for travelers. very quiet rooms, lots of big windows. This was one of my worst experience in a hotel, and I have stayed in hundreds of hotels throughout the world. This is one of the best examples of a pretentious, artsy hotel, where nothing is really thought through, and the hotel guest comes last. To give you some examples: - bathrobe and slippers provided, but someone seem to have thought that slippers can be bought in one-size fits all fashion; if your shoe size is 35 to 37 maybe they would be usable for you, but totally useless to me - customer service: I mentioned the too small slippers, the guy replied that he is not in charge of that but he would try to forward it to someone else; never heard again from him, neither were the slippers exchanged for larger ones - the room service menu is hard to recognize as such. There is one printed DIN A4 page, cheaply laminated, reminding the guest of the code of conduct. The room service menu is on the back. Who would have guessed?!! The items are scarcely described. I ordered Vitello Tonnato, only to realize that when it arrived there was no bread coming with it. So I ordered some bread on top of it. The employee was kind enough (?!!?) to waive the surcharge fee of 7.50 EUR for room service orders, not to mention that a small sample of cheap bread was prized at 4.50 EUR. The Vitello Tonnato tasted as if someone just opened a ready made, food package from the local discounter. - Topping everything was the inability to adjust the room temperature to one's own liking. Therefore every customer is subjected to the whims and preferences of the hotel management when it comes what constitutes a comfortably warm room. I felt cold and the room temperature was kept definitely below 20 degrees. In Summary: Avoid this hotel by any means. There must be alternatives left, where actually someone cares and thinks with the customer in mind. Very recommanded hotel. Best hotel in city. close to everything- shops, officesm restaurants. Very modern , clean and nice. It seems every room has its own personality, will definitely gonna come back to this hotel! The room was very good, better than we expected . Good WI FI. My friend had a knife-cut wound at finger, we got the bandage and paracetamol at 1.30 AM at the counter, very good care and service, Thank you. the stay at the hotel was really nice. 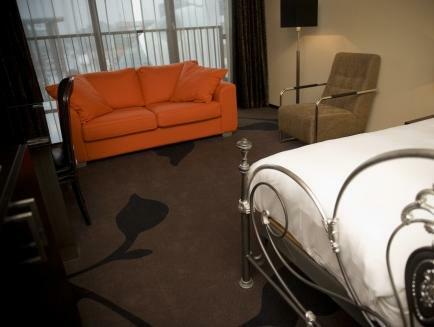 the hotel is conveniently located near the train station and the heart of the city. Eindhoven is the home of philips, so most of the townsman work in that company. the nearby towns are very pretty too if you have time to explore a couple train spots away. this hotel has it all. every room is designed different and in a very artfull and stylish way. that's probably why it's popular. when we arrived the reserved room was taken. no problem, we had an instant upgrade to the suite. a room the size of a ballroom, with a jacuzzi. maybe the only thing that was worth noting were teh separate matrasses, but they alos slept good. breakfast was well taken care off and we had no complaint what so ever. 출장으로 Eindhoven 에 가야 되서 예약한 호텔인데, 가보니 조식도 맛있고, 역에서 10분거리라 편했습니다. 매우 넓직한 방마다 서로 다르게 예술적으로 인테리어가 되어있어서 특이하고 편했습니다. 특히 유럽호텔에 잘 없는 욕조가 있어서 좋았어요. 역에서 매우가까우며, 주변 쇼핑가나 마트에서 가깝고, 그러나 조용합니다. 조식이 포함이 안되어 있고, GYM이용시 별도의 제휴 업체(바로옆)에 유료로 이용해야함. 그러나, 색다른 분위기의 호텔이라고 할 수 있습니다. Het verblijf was goed, de ontvangst vriendelijk en de kamer heel mooi en geluidsvrij ondanks dat je midden in het centrum zit op loopafstand nog geen 5 minuten. De minpunten waren dat de douche alleen koud water gaf, we geen stopcontacten bij het bed voor de opladers hadden en wij vonden 21,50 voor het ontbijt sowieso veel te duur. Verder hebben we genoten.